We hear about cancer spreading and often fear that it will spread. But you may be wondering why cancer cells spread when normal cells stay put where they belong. And how do they end up in parts of the body far removed from the original tumor? Cancer, when it stays where it begins, can be very treatable with surgery or other treatments. The reason physicians and cancer patients alike dread this is because spread (metastases) is responsible for 90 percent of cancer deaths. Luckily, research is in progress looking at ways to prevent cancer from spreading. Cancer begins after a series of mutations lead to cells that divide as if they are immortal (never die). This is followed by the growth of a tumor that can invade nearby tissues and organs. But how do cancer cells detach from the tumor (unlike normal cells that stay in the organ they belong in) and spread? A simplistic way to look at it is that normal cells are “sticky.” Heart cells stick to other heart cells and don't travel to the foot for example. Scientifically normal cells make substances called adhesions molecules that make them stick together. Adhesion molecules can be viewed as similar to glue. Cancer cells, in contrast, lack these adhesion molecules making it easier for them to break off and thus travel. 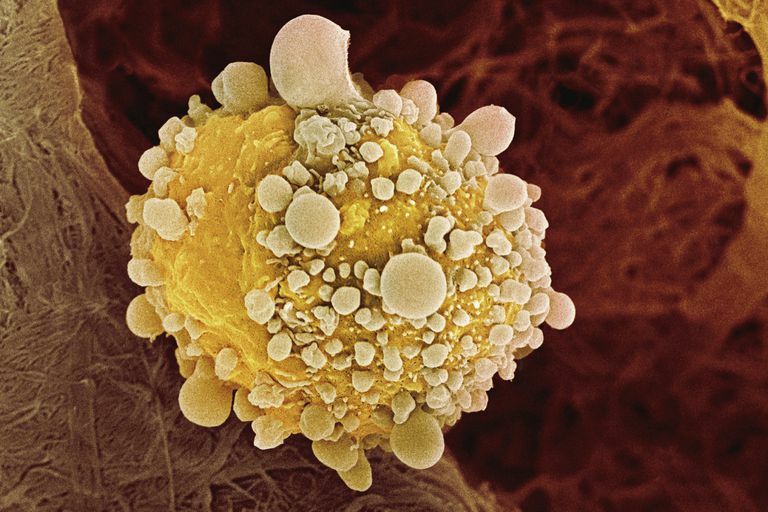 Normal cells also understand their boundaries better than cancer cells by communicating with neighboring cells and tissues. Locally (Regionally: Often the first place cancer spreads is nearby where the tumor starts. Doctors use the words "locally" or "regionally" to describe this kind of spread. In some ways, this is like the growth of a benign (non-cancerous) tumor, but in other ways it is different. While benign tumors can cause problems (especially if they are in an enclosed space like the brain) they tend to be more "polite" and respectful of bordering tissues and cause damage when they push on nearby tissues. Cancers, in contrast, ignore those boundaries and may invade neighboring tissues and organs.regionally, or locally near the original tumor. This claw-like extension into surrounding tissue is responsible for the name cancer, which comes from the Greek word for crab. Through the Bloodstream: Cancer cells may also enter the bloodstream through which they are carried around the body. Through the Lymphatic System: The lymphatic system plays an important role in defending the body from cancer, but can also serve as a conduit through which cancer spreads. After expanding locally, cancers tend to spread to nearby lymph nodes via the lymph channels first. Once cancer cells spread to another part of the body and begin to form a tumor, it's necessary for the tumor to have a source of nutrition. They accomplish this by a process of forming new blood vessels to bring nutrients to cancer. Researchers have named this angiogenesis. Medications called angiogenesis inhibitors have been used for some cancers, and further work is in progress to find drugs to stop the process of blood vessel formation by tumors so they cannot grow. As noted above, spread (metastasis) of tumors is responsible for most cancer deaths. But the consequences can vary depending on where cancer spreads. Spread to the brain can cause seizures, paralysis, and death. Spread to the lungs can compromise lung function. Spread to bones can cause fractures and the disability associated with fractures. What is a Metastasis and Why, How, and Where Do They Happen?